Total investment in building construction decreased 3.2% from September to $14.1 billion in October. Both the residential (-4.2% to $9.7 billion) and non-residential (-0.8% to $4.4 billion) sectors declined. On a constant dollar basis (2012=100), investment in building construction decreased 3.8% to $12.2 billion. The decline in residential investment was widespread in October. Investment in the single-unit category fell 4.8% to $5.1 billion, while the multi-unit category (which includes doubles, row homes, and apartments) declined 3.5% to $4.6 billion. 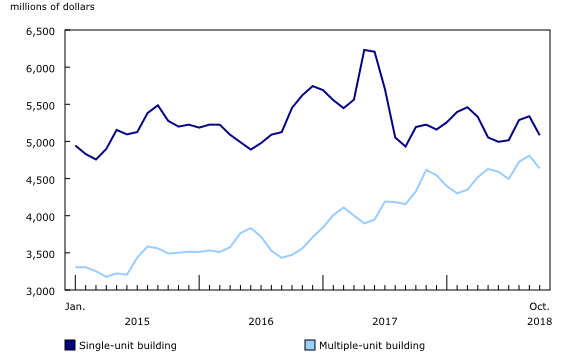 Although the month-to-month comparison showed a decline in residential investment, on a year-over-year basis investment in multi-unit dwellings rose 7.2%, while investment in single-unit dwellings fell 2.1%. Investment in non-residential building construction edged down in October, as gains in the industrial sector (+0.2% to $0.9 billion) were offset by lower investment in the institutional (-2.0% to $1.1 billion) and commercial (-0.5% to $2.5 billion) sectors. 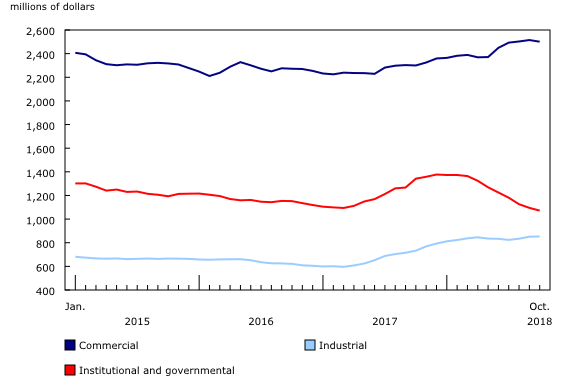 Overall, the past 12 months have seen a slight increase in non-residential investment (+1.2% to $4.4 billion), led by strength in the commercial (+$201 million) and industrial (+$120 million) sectors. In contrast, investment in the institutional sector was down by $269 million (-20.1%) compared with October 2017. 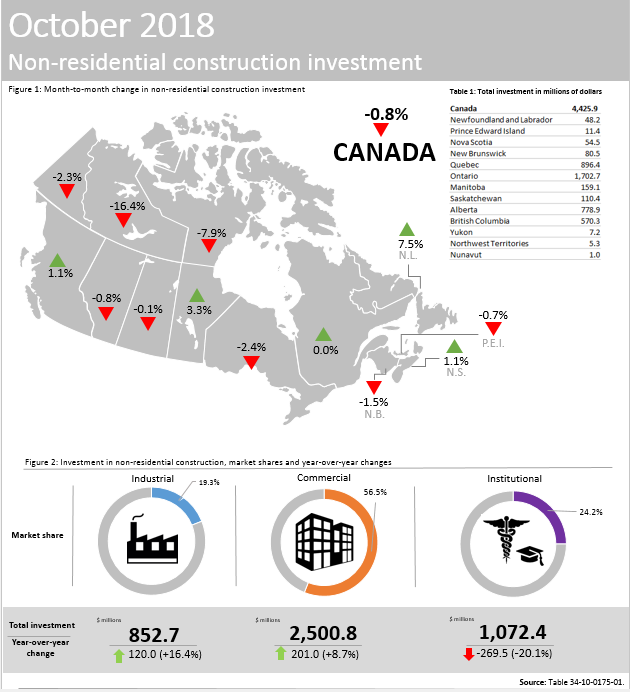 In October, six provinces reported declines in total investment in building construction, driven by Ontario (-$322 million) and Alberta (-$115 million). In the residential sector, the downward movement in investment was also led by Ontario (-$280 million) and Alberta (-$108 million). 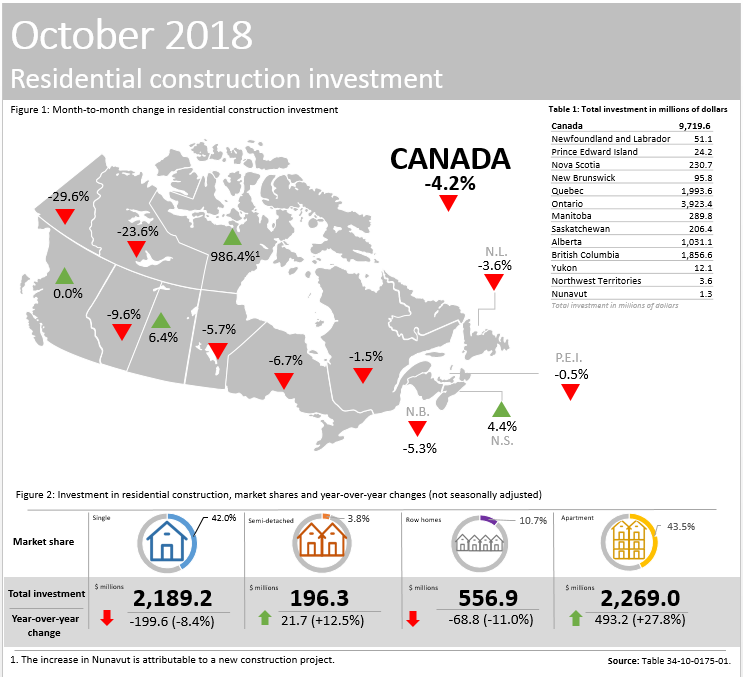 On the non-residential side, investment for October would have been largely unchanged, except for a $42 million decline in Ontario. On December 21, 2018, the "Unadjusted – constant" and "Seasonally adjusted – constant" data for type of structure "Apartment" have been updated up to September 2018. The change is a result of a correction to the methodology for rebasing the deflator. 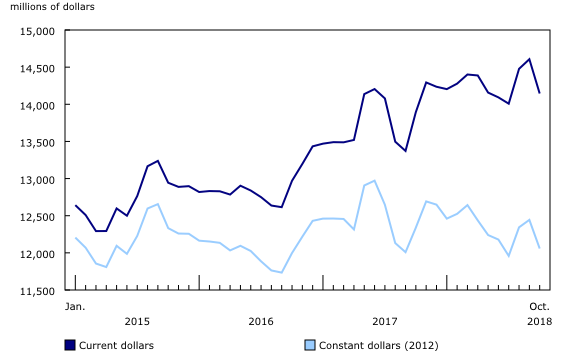 The residential constant dollar series have been revised for January 2015 to September 2018. The remaining data have been revised following standard revision practices. As a result of data source constraints, the total value for "Type of Work – All" may not equal the sum of its parts (new construction, renovation, conversion, and other). The component required to complete the summation is Type of Structure, Minor. In the type of work series Conversions Total, one or more residential dwelling units are created from an existing structure. Deconversions, garages and carports, as well as in-ground swimming pools are grouped together in the Other types of work category. Effective November 23, 2018, table 34-10-0175 contains data on both the residential and non-residential sector. It replaced tables 34-10-0010, 34-10-0011, and 34-10-0012. Data on investment on building construction for November 2018 will be released on January 21, 2019.